We’re in the thick of summer now and it is HOT. It’s also very humid here in SoCal right now which is surprising for this time of year. We are not used to the humidity! It also RAINED here this past weekend. What’s up with that? Baby Awesome and I spending the day volunteering at the beach. This photo is a selfie and was taken at the beach. For the past several years I have volunteered with an organization that introduces at-risk youth to action sports. It’s a wonderful program and I look forward to their surfing program every summer. This year I have gotten to introduce Baby Awesome to the program. She came with me to volunteer and we spent the day as land volunteers helping out getting people organized and passing out food and water to the surfers. We had a great time! We spent a good portion of the day hanging out in the outside canopy. 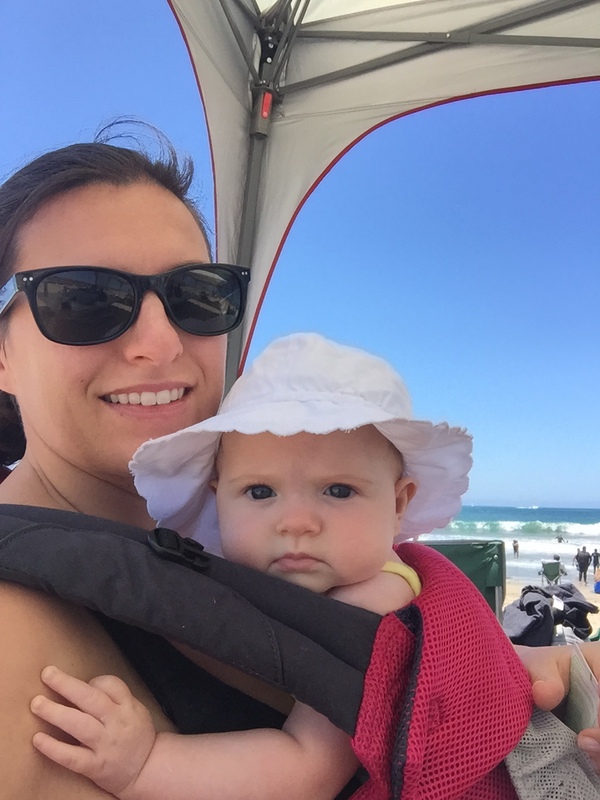 As you can see from the pic, Baby Awesome has a sun hat on and I’m in my sunglasses. We both wore sunscreen, too. It is extremely important to make sure you reapply sunscreen every few hours when you’re in the sun. Even if it’s not sunny out, you can still get a sunburn so always make sure to lather up! The Giveaway – Win A $100 REI Gift Card! What about you? How do you protect yourself from the sun? Post in the comments and let us know! February Fitness Challenge: Move Nourish Believe Style! Fortunately my face moisturizer has a built-in sunscreen but if I’m outdoors for an extended amount of time, then I reapply with SPF 50. I also wear sunglasses whenever I’m outside & while at the beach, I always wear a hat. I’ve been running quite a bit preparing for a fall marathon. My wife and I just ran the Rock ‘n’ Roll Chicago Half Marathon this past Sunday, the race time start temperature was 75 degrees with high humidity! My kids have been swimming quite a bit lately and just finished up baseball season last night, we’ve been going through a ton of sunscreen! I’ve been trying to be better about protecting my skin from the sun this summer. I got a terrible burn at a race in June and ever since then I’m so nervous about it! We have been camping, waterskiing, and hiking. Love summer and REI!! We have been swimming a lot this year.